Handyman Service Home repair Contractor Tampa FL. around your busy schedule. The last thing you need is to be waiting on the serviceman. We pride ourselves on being your on time handyman and in many cases we arrive early. We also keep our scheduled appointment with no disappointments and no excuses! You have come to the right place. 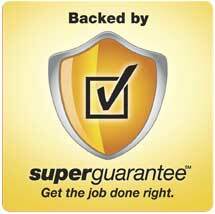 We are professional, trusted, and known for our dependability. Not only do we offer superior handyman services, we are also a fully licensed residential contractor, offering beautiful kitchen and bathroom remodeling as well as the small jobs such as garbage disposal replacement, small wall repairs, faucets, faucet repair, and toilet repair. From door to door we've got you covered. Whatever your home improvement needs, large or small, give us a call today. 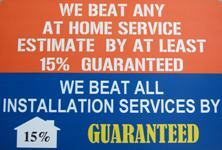 Phil's Handy Service Inc, known to be the contractor that cares, is an EPA RRP Lead-Safe Certified Contractor. Under Federal Law as of April 22, 2010, contractors performing renovation, repair, and painting projects that disturb lead-based paint in homes, childcare facilities, and schools built before 1978 must be certified and must follow specific work practices to prevent lead paint poisoning in children and pregnant women. Lead paint was commonly used in Tampa homes. State of the Art dust control measures are used on all jobs, no matter how large or small, to contain dust and protect air quality in your home. 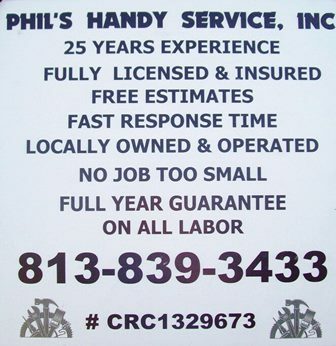 We know with so many choices in handymen and handyman services, it's sometimes hard to find the good guys. Please take a moment and visit our review page. There you'll find many reviews submitted by your neighbors. Thanks again and we hope to hear from you soon.